Oh how I’ve missed blogging! I apologize for the complete lack of effort on my blog for the past months, I’ve been super busy with uni and with some personal stuff. But now I’m finally back and will be posting more regulary – more makeup looks, fashion & beauty related blogposts are definitely coming! In today’s blogpost I’ll be sharing my favourite products for the month of March. Feel free to share what products you’ve been loving this month. 1. L’oreal Paris True Match Foundation in N6 Mel Honey has been one of my favourite drugstore foundation lately. It has a medium covarage and what I love that it leaves the skin looking glowy and flawless. 2. Anastasia Beverly Hills Brow Powder Duo in Dark Brown. I’ve used this brow powder duo quite a lot this past month and I love it! 3. MAC Prep + Prime Highlighter in Bright Forecast is a product that I have been loving the last couple of months. The highligting pen is quite sheer by itself but over a concealer it gives the skin a really nice highlighted effect! 4. EOS Lip Balm. Lately I’ve prefered a more natural moisturized lip. The EOS lip balm does a great job keeping the lips moisturized. 5. MAC Fluidline in Blacktrack is the perfect gel liner! It’s an intense black colour that stays in place all day! 6. KARA eyelashes in #107 has been my go-to lashes whenever I’ve been going out. Read my review on the KARA lashes here. 7. L.A. Girl Pro. Conceal HD. Concealer in Creamy Beige is my new favourite concealer. I’ve heard nothing but great things about the concealer – AMAZING coverage and super affordable. A review on this concealer will be posted very soon. 8. Anastasia Beverly Hills Brow Wiz in Ebony is the best eyebrow pencil I’ve tried! The shade is the exact same colour as my eyebrows and it gives the eyebrows a very natural look – LOVE it! Great picks, must make it my business to try some Anastasia products, heard great things about their brow products! L’oreal True Match is an absolute favourite of mine. I’ve tried a mixture of high end and drugstore foundations and have found none that can compete, in my opinion. I tried the la girl concealer and it was too opaque for my liking. Since there are so many people who have nothing but great things to say abou this product, I’ll give it one more shot before I toss it. Btw I do love the coverage of the true match. Yes it’s very opaque but I love that! Give it another try and maybe use a different tool to apply it! Yes the coverage of the true match is perfect love it! 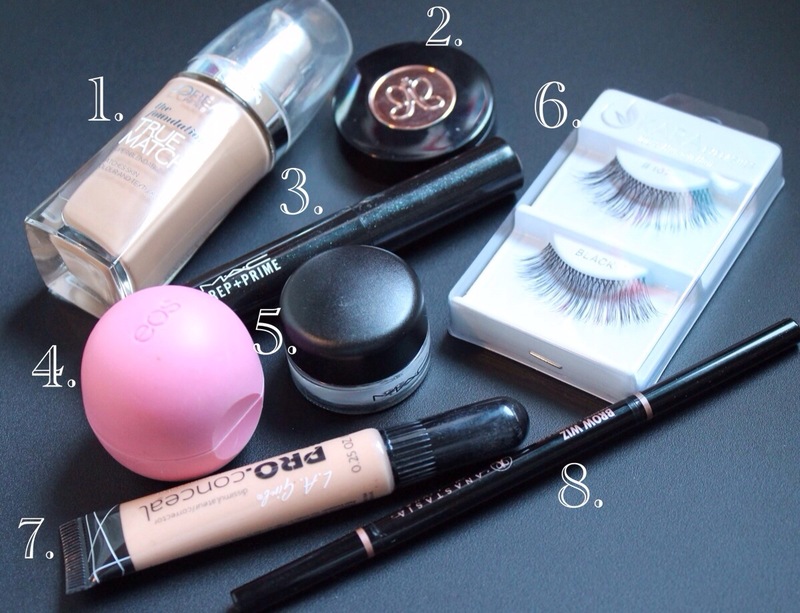 I expecially like #2….where did you buy it?